Well hello. I apologize for my lack of posting, but we got hit by the dreaded preschool initiation germs that landed poor Matthew and myself on our rear-ends. It is so tough when your baby is sick and you are barely able to stand up straight yourself. Very thankful for my husband, a.k.a super dad, and the miracle that is antibiotics. Getting sick on the first day of Fall was irritating because I LOVE Fall and all things Fall, and the germs put a big damper on my enthusiasm. I am making up for it now, and it even feels more special because it is amazingly under 80 degrees outside today, unlike last week. My mom also made my pitiful self this amazing pumpkin bread too. Squee! So I know this may come as a shock, but I’m kicking off my Fall posts with a pumpkin recipe. For my fellow pumpkin enthusiasts, there is more than one reason to love pumpkin. It is crammed packed with fiber–beneficial for heart health and weight loss, has beta-carotene, a powerful antioxidant that may play a role in cancer prevention, and 1 cup of it has more potassium than a banana. What’s not to love? For those of you who adore pumpkin, but maybe also struggle with feeding yourself a nutritious breakfast before you blast out the door (like me), here is a solution that I recently discovered and decided to play with. 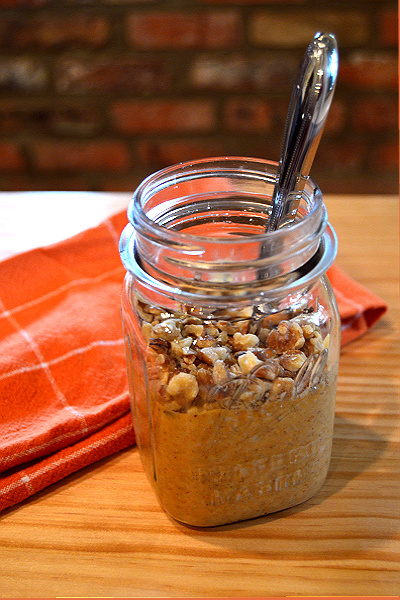 Overnight oats can be put together the night before, thrown in a mason jar and then conveniently eaten on the road the next morning if you are in a time crunch. The nice thing about oats is that they are so versatile, you can pretty much do anything to them your imagination allows to keep them from becoming boring. Throw some nuts in for a punch of protein, and you are much less likely to veer off track with snacks or treats later in the day. This is why a fiber and protein-rich breakfast can help shrink your waistline (it’s true). 1) Combine oats and milk in a microwave-safe bowl. Microwave for about 1 minute and 30 seconds. 2) Remove from microwave, add rest of ingredients (except for nuts), mix well. 3) Pour mixture into small mason jar, cover and refrigerate for a few hours or overnight. 4) When chilled, remove cover, layer the top with nuts, and enjoy. Easy-peasy. What’s your favorite oats recipe?